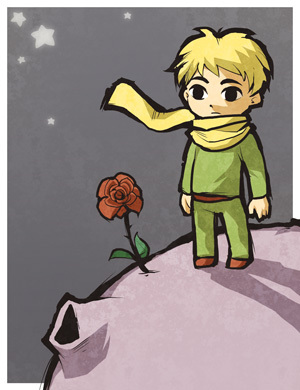 During his adventures on Earth, the little prince discovered a garden abloom with 5,000 roses. He was startled, because he realized that the fancy rose he had left behind on his faraway planet, the rose he had looked after with so much devotion, was not a unique flower. So he lay down in the grass and wept. The same is true for writing a novel, or painting a portrait, or building a house of cards… If you enjoyed working on it, you will never regret the time you devoted to it even if the book doesn’t sell, or the portrait is badly received, or the house of cards collapses… You will be sad, and weep, and maybe think of changing your trade, but you will not regret. Writing a novel seems to some like a good way to waste time. Sometimes it’s difficult to explain to others around you – even to family – that words on a computer screen or ink on white paper are much more than they seem. Painters can show their unfinished canvas, and if it is colorful, it might pacify some of their naysayers. But writers don’t have much to show until all their story is written. Telling a person not interested in books ‘I’ve written 5,000 words so far,’ means to them the same as ‘I’ve written 50,000 words so far,’ that is to say not much. Things are even harder for me because I write in English, which nobody around me understands. But writing a book – or creating any kind of art – changes you inside. It helps you understand more profoundly your thoughts and emotions, as well as the world around you, and it provides much needed emotional relief, and often it also helps you see your life from a different perspective, which is sometimes necessary before you can make changes. To me those are the true rewards of writing. The publishing, the fame, the money, the immortality, are all bonuses. They may or may not come, depending on Fortune’s whims. Artists, by creating stories, whether on paper, canvas, or piano, learn how to see better with their hearts. What have you done with those big sunglasses? Upon looking at that photo closely, I realized I looked very praying mantis like. Well said. How we spend time should be at the forefront of our minds. Spending time on creative pursuits is a brilliant way of spending it in my mind. Interesting that you say,”because I write in English, which nobody around me understands”…Perhaps sharing some of your writings with them in their language, they will understand. Your writings are thought provoking, good and definitely not a waste of time! I don’t really write in my own language. That was so beautiful…thank you for sharing it!!!! Anyone who can love is an artist for love is pure art seen only with the heart. I agree with you. I changed the sentence a little to reflect more what I meant to say. I certainly did not waste time reading this! Thanks for sharing. Aren’t you afraid that you will swallow your tongue piercing somehow? I have and it wasn’t scary. Aren’t you afraid your hat will blow off your head in the wind? I am, but that won’t cause any damage to anyone! Unless it is a heavy hat or extremely high winds and the person has hot coffee. My point is there are risks with anything in life, but do risks stop us from doing things or having things we like? “But writing a book – or creating any kind of art – changes you inside. It helps you understand more profoundly your thoughts and emotions, as well as the world around you, and it provides much needed emotional relief, and often it also helps you see your life from a different perspective, which is sometimes necessary before you can make changes.” — yes. I think I said it before but how can one so young be so insightful? I think you’re actually an aged, withered old sage who enjoys slapping us in the face to wake up. Thanks for the reminder of why I write, why I take my photographs, and why I blog! I think I might be good with words, but speaking about things doesn’t necessarily make me good at doing them. 🙂 I’m trying my best thought. Snowy man! Oh, this made me smile. I think I needed to read this right now! You are soooooo…..right! I used to have to be busy, busy, busy. But now, my favorite moments are moments that others consider wasted time. Now, if I could just figure out how to ditch my job so that I could “waste” even more time. An added bonus for my new chill factor is better health. I was stressing my body out…..now….I’m being kind to myself…and minor health problems are disappearing. I love reading your blog! Your insights are amazing and your writing so smooth and clear. Thank you. It was the wise fox who said that! Your poems are poetical, as they should be. I love the Little Prince book; I read it when i was 9 and loved it. Wasting time is more fun because unwasteful time (according to my teachers) would be doing maths, instead of staring out of the window or writing the diary of a cheesecake (I did that in food tech once!). Yay! You read it! That makes me happy. It sounds like you thoroughly appreciated it also, which is far more important. i like Bertrand’s quote, as well as the prince.